Microsoft may be struggling to compete against Sony's sales-busting PS4, but a new rumour suggests the company behind the Xbox One could be teaming up with an unlikely competitor to bring its portfolio of exclusive titles to a wider audience. According to an insider report from Direct Feed Games, corroborated by Game Informer, Microsoft is looking to partner with Nintendo to bring the Xbox Game Pass - it's 'Netflix for Games' style subscription service - to the Switch, bringing the entire library of titles available on that platform with it. 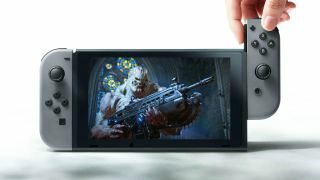 Apparently, Microsoft plans to use its highly advanced xCloud streaming technology to allow Xbox Game Pass games (many of which are too powerful to run natively on the Switch) to be playable on Nintendo's portable console. The idea of Gears 5 operating on Switch may sound impossible, but remember that the open world RPG Assassin's Creed Odyssey is already available as a Switch streaming title in Japan, and operates fairly well compared to its home console counterparts. That said, many Xbox One games on the Games Pass could, in theory, run natively on Switch, and Direct Feed Games also mentions that Microsoft wants to publish some of its exclusive titles on Switch in addition to these rumoured Game Pass plans, includingi the critically acclaimed indie platformer Ori and the Blind Forest. This gossip follows a report earlier this week that Scalebound - Platinum Games' cancelled Xbox One exclusive - is being revived as a Nintendo Switch game, though it's unclear if Microsoft has any involvement in that potential production. Neither Microsoft nor Nintendo have offered any official comment on either of these developments, though the two games industry titans have worked together more closely in recent months, delivering cross-play between their two respective platforms across a range of multiplayer titles, such as Fortnite and Minecraft. We'll update this story if we hear anything more in the coming days and weeks but, for now, keep your fingers crossed that we could be playing the likes of Halo Infinite and Sea of Thieves on the go in the not too distant future. To discover all the potential new titles coming to Xbox Game Pass, check out our guide to every upcoming Xbox One game on the horizon.